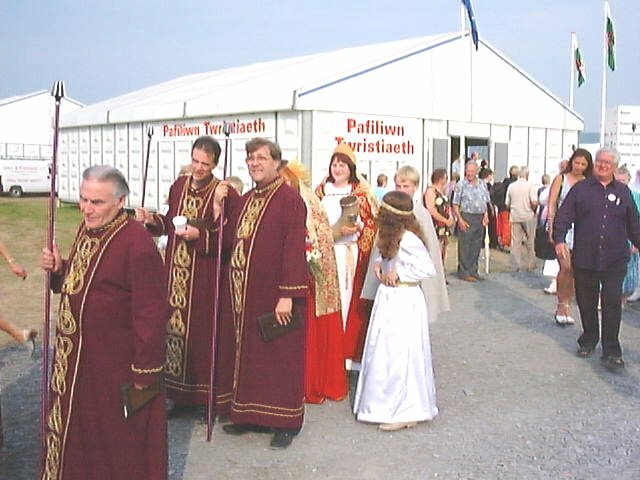 Here we see various picturesquely-attired members of the Gorsedd on the occasion of the Cadeirio (Crowning ceremony). Behind the gentlemen in purple robes (the white Styrofoam cup is not part of the costume) is a matronly figure holding the horn of plenty, which is used in the dawns y blodau (flower dance) performed by young girls to welcome the new bard to the stage. The Gorsedd traditionally arrive in a fleet of double-decker buses, and those wearing white robes sport matching white suede ankle-boots. Readers of a sceptical nature, unacquainted with the intricacies of bardic tradition, may well wonder if I am making this up. I am not.